Do you want to hate me? I’ll give you more (or your first) reason to today. 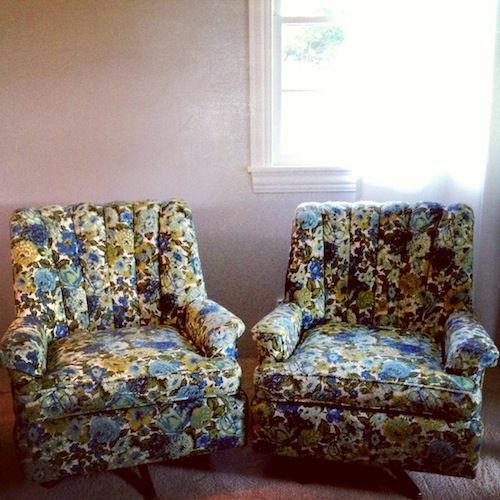 I found these two vintage floral chairs on craigslist last Friday. For free. 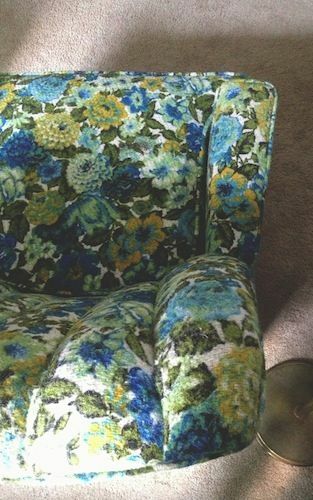 Nearly perfect condition (minus missing one slipcover) and in blues/greens which are the most appealing shades for this type of vintage floral fabric, right? 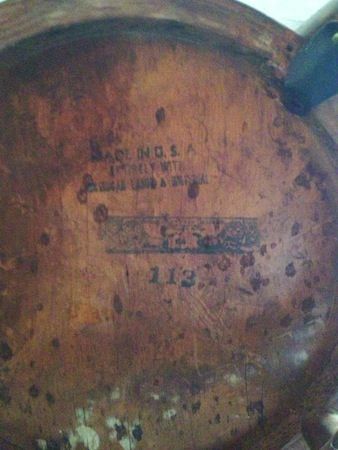 Unless you don’t get the magic of some of the furniture your grandparents have/had. These get me even though I’m not a floral person. I’ve actively searched for chairs like these to purchase, all got away rather fast then woosh, in the free section on craigslist. Like to think I did something pretty good to deserve these. And I was one of those people who swooped in and took it from someone else who thought these beauties would be theirs that afternoon. Wahwah. The owner told me if we could be there before 2, we could have them instead. The problem is that Greg was at work in the metro and they were still 30 miles north of there so he left work to get them then went back to work. 60 more miles under his belt that day. But I’d say worth it. I don’t even feel too bad for the other person. One look then a sit in these and I say weeeeeee because they swivel and rock. And that’s fun so I forget the bad feeling. Primed and ready to go. One is already painted in the saturated tone I picked up last night. On the 4th of July we took a trip to Minneapolis to pick up more of the special order subway tile we need for the bathroom. We’re taking the subway tile we bought for the upstairs bathroom reno and using it in the basement bathroom reno since we moved the schedule around and won’t be getting to the other one until who knows when really. Just happened that someone had 2 boxes left from their project, listed them on craigslist and ta-da we saved big bucks. While up there, we stopped at Whole Foods, a barn sale (not worthwhile) and picked up these 2 chairs from another craigslister. 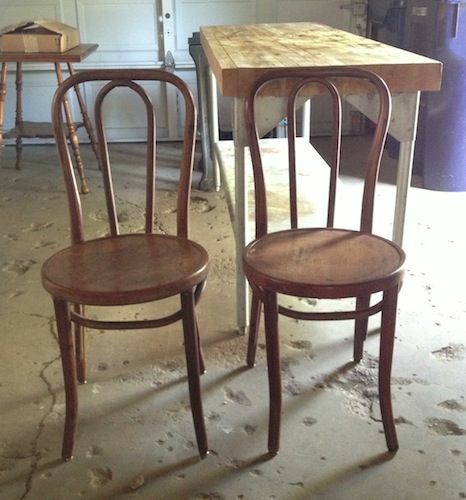 They are not bentwood chairs from Thonet (not that it mattered to us) as they look but from a company called the Great Northern Chair Co.. Thonet, thought to be a pioneer of industrial design, mastered the art of steaming and bending wood then that method was reproduced by several companies, Great Northern Chair Co. being one. We’re both amazed with this process, especially Greg since he is a furniture design guy for his company. Inspiring talent. Old and sturdy, built to last-a quality we admire and collect. I have wanted this style of chair for my eclectic mismatched dining room (whenever we actually get to make that happen) for years. $20 for the two. A little work and they are indeed in our dining room. So, now we have 2 steel-based Eames chairs, an Umanoff stool, Sturgis Posture chair, the vintage floral swivel chairs and these 2 Thonet-looking cafe chairs. My faux Tolix chair sold. I think we have a thing for chairs. I’m keeping my eye on another style on craigslist. 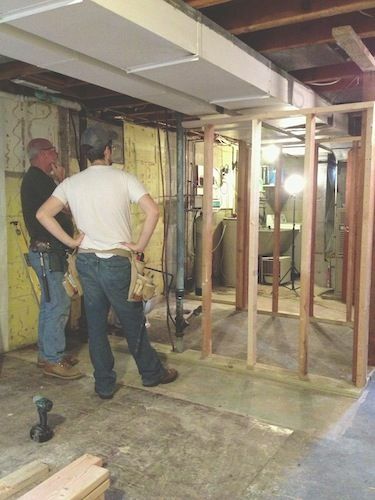 Also, I was supposed to show the basement bathroom progress from when my parents and sister came to visit a few weeks ago but have decided to wait until even more is accomplished. The goal is to have it finished by Labor Day. We’ve not done a thing to the space since they’ve been here. Nothing substantial anyway. I have most things picked out, about half has been purchased (or ganked it from the upstairs bathroom reno supplies) and we’re facing another $900 worth of materials. Which might as well be $1 million to us right now. Instead of working in the cool basement, we’re sweating in the garage working on furniture and that free “new” exterior door we picked up a few months ago. Free is great (see above chairs) but we’re definitely pumping a lot of work into this baby. We didn’t have enough Soy Gel stripper so we picked up Zinsser Magic Strip gel (which is awesome) and then began the tedious job of removing a few layers of paint-one of which was black. 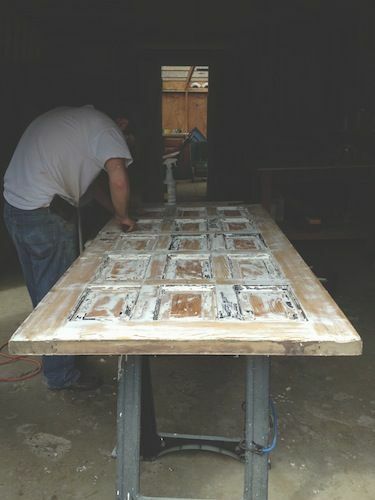 We’ve been sanding, stripping, and lightly rinsing off the door. Hopefully we’ll be finished with that soon. 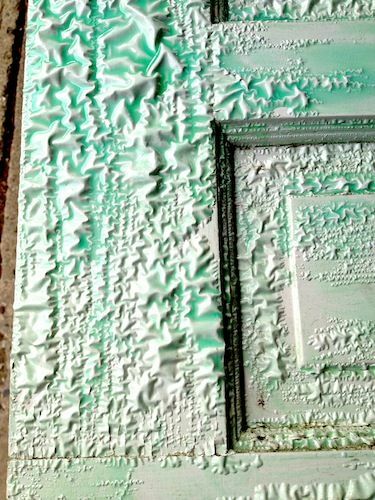 Greg and I have been trying to afford the Wagner Flexio 590 HVLP (high volume, low pressure/airless) paint sprayer-or find it on craigslist-which means we could spray all the doors, trim and furniture faster and easier with better results than by hand. It makes sense for us but it’s not in the budget right now. *I know I said we’d go for the Graco sprayer but upon closer inspection of the capabilities, it’s clear this Wagner would be much better for us. 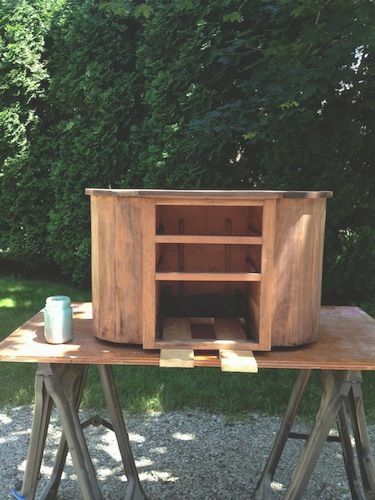 The Martha Washington sewing cabinet is just waiting for hardware. But, I don’t have a clue on it for once and Hobby Lobby is taking forever to deliver the 6 sample knobs I ordered. 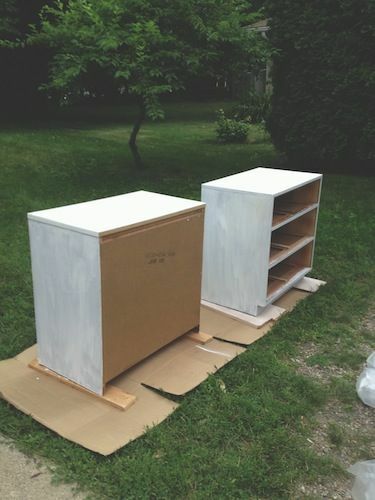 The 2 dressers are primed, we picked up paint for one and ordered paint for the other. 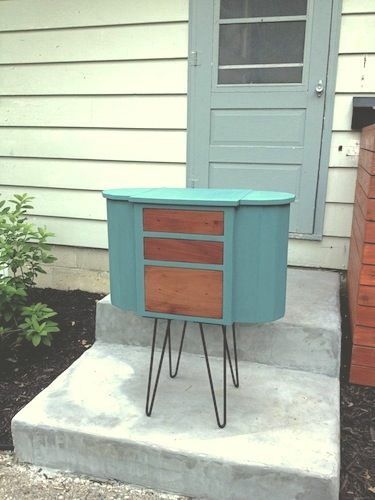 My mom’s old side table has been sanded and painted but the sample size milk paint I ordered didn’t go as far as it said so I had to order more putting that project on hold. I love the rate we’re finding/working these days on furniture. This feels right. 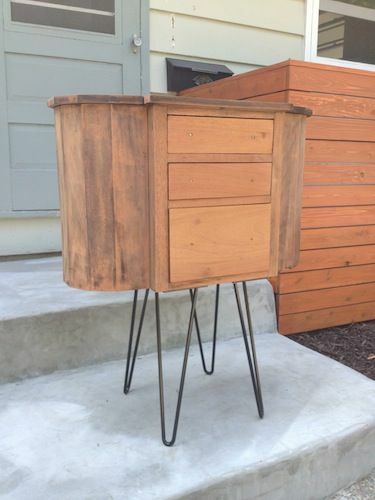 Any furniture finds for you these days? This entry was posted in Bathroom Projects, Bathroom Reno, Chairs, Dressers, Furniture Finds, Milk Paint, Our First House Projects, Paint, Thrifty Finds and tagged cafe chair, chairs, craigslist, Eames, floral chairs, furniture, Great Northern Chair Co, Martha Washington sewing, sewing cabinet, Sturgis, Thonet, Tolix, Umanoff, vintage. Bookmark the permalink.